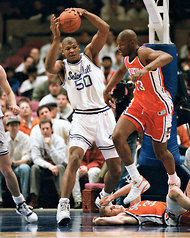 Luther Wright at the 1993 Big East tournament, when he played for Seton Hall. He was later treated for mental illness. We’ve seen it hundreds of times. An athlete is injured and within seconds is surrounded by an armada of medical personnel: trainers, assistant trainers, team doctors. The athlete is helped off the field, given a diagnosis, treated and sent to physical therapy, often to return miraculously in a week or two. But when that same athlete has a mental disorder, there is no armada of trainers, no team doctors. That athlete is often abandoned. For all of the current focus on traumatic brain injury as a result of concussions, mental illness, often overlooked, exists at every level of sports. Sports too often is a masking agent that hides deeply rooted mental health issues. The better the athlete, the more desperate to reach the next level, the less likely he or she will reach out for help. The gladiator mentality remains a primary barrier. “Mental health has a stigma that is tied into weakness and is absolutely the antithesis of what athletes want to portray,” said Dr. Thelma Dye Holmes, the executive director of the Northside Center for Child Development, one of New York’s oldest mental health agencies, serving more than 1,500 children and their families. Holmes was among a group of health care professionals and former professional athletes who met recently at the Schomburg Center for Research in Black Culture in New York to discuss the problem of mental health and mental illness in athletes. The gathering was part of a series of salons initiated by Schomburg’s director, Khalil Muhammad, to explore the relationship between sports and the African-American community. But mental illness knows neither race nor ethnicity, and at a time when brain trauma has become front and center of a national conversation about safety in sports, mental illness is the silent spike of the sports industry. Asking for help is looked upon as a weakness in a community in which coaches preach mental toughness. The former W.N.B.A. star Chamique Holdsclaw has spoken of her fight with depression. “They believe nothing can go wrong, they don’t need help, they can overcome,” Dr. Ira Glick, professor emeritus of psychiatry and behavioral sciences at Stanford University School of Medicine, said in a telephone interview. There is, of course, a related issue: confidentiality. Whom can a player trust? “Players want to have somebody to talk to, but they don’t want their teammates or the team to find out because of the stigma and they’re afraid of being dropped,” Glick said. Luther Wright can attest to that. He was a high school star in New Jersey, attended Seton Hall, then was a first-round pick of the Utah Jazz. Wright published an intriguing memoir — “A Perfect Fit” — that chronicled his journey from the celebrity of being the largest baby born in New Jersey that year to stardom in high school and college, to a season in the N.B.A., to drug and alcohol abuse and, finally, to a diagnosis of mental illness. According to Wright, who attended the conference, an athlete desperate to provide for his family — and to reach the professional level — may not feel he has the luxury to divulge, much less explore, a mental health issue. “You can’t get sick,” Wright said. “At the college level, that’s your proving ground. There’s no room for any type of diagnosis for mental health issues because that would put up a red flag and maybe block you from going to the next level. A complicating factor is that coaches are often ill-equipped to recognize and deal with mental health issues. But the coach of the future, Holmes of the Northside Center suggested, may need to be better prepared. Indeed, coaches could be required to have a certificate, if not an advanced degree, in mental health. Professional leagues and governing bodies at the high school and college levels could ensure coaches work with mental health practitioners who could train them to look for signs of trauma, bipolar disorder and depression, among other maladies. 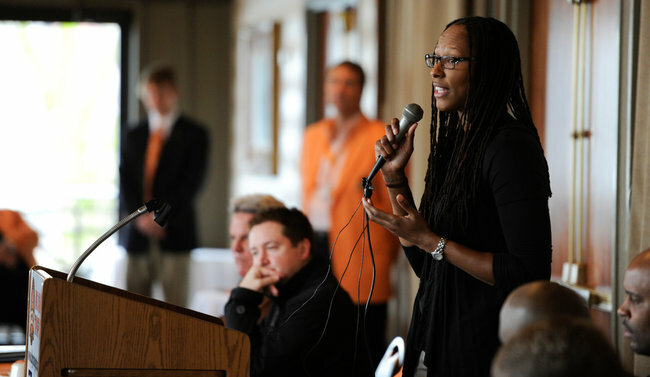 “Coaches need to know they’ve got somebody to talk with if things get out of hand,” Holmes said. Coaches aren’t the only ones who fail to recognize mental health problems. General managers and team executives may look the other way, or go into denial, when mental health problems emerge in an enormously talented athlete. Glick argued that owners by and large do not want to address the notion that athletes face mental illness. In fact, Glick said he felt some owners feel that disclosures could hurt business. But are players and owners really adversaries when it comes to mental health and mental illness? Dr. Janet Taylor, a New York-based psychiatrist, who also attended the conference, said that she is not convinced they are. It is not unusual for the public to be suspicious of athletes who were sidelined by mental health problems. But as the existence of these issues become more prominent in society, athletes’ emotional episodes may be viewed with greater understanding.